Stitch up this easy crochet bag pattern for a fun day at the beach. Surf's Up! 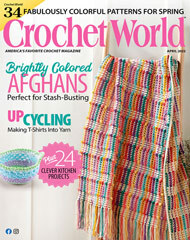 Crochet Bag Pattern was originally published in Annie's Hooked on Crochet! April 2008. Finished size: 12" x 17". Crocheted beach bag is made with medium (worsted) weight yarn and H/8/5mm crochet hook.